Used once so far for Scout Camp lighting. So far worked well. Good priced, good quality batteries which were delivered when excepted. 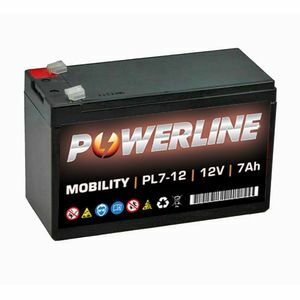 This mobility battery was purchased to replace faulty batteries on an old mobility tricycle. The dimensions meant it fitted perfectly. and was totally as described. The delivery was as stated. If I had a complaint it would be only be the packaging while totally adequate was a little messy with crumbling polystyrene getting every where, so only a small point. Bought to use in an APC CS500 UPS and this is the 2nd I have bought. The first has been working fine for a month or 3 but that, of course is a short time and it remains to be seen how long these batteries last - hopefully about 3 - 4 years. Time will tell. Good low cost battery to get my UPS back to health. Appears to be a good buy, Held its charge o.k. once fully charged. For use in a "fish-finder" on a boat, (fuly enclosed). Will not get a great ammount of use but will be needed to run all day when used, we'll see how long it lasts. Good price. Well, what to say! The item arrived promptly, fitted correctly and works. The question is how durable it will prove to be. this was the fastest and most efficient service i have ever received,the product was with me less than 24 hours later,keep up the good work. Fitted To: it was for my torch.